This workshop is for people who have attended the Get Off Auto beginners course and are ready to take their photography to the next level. It is also suitable for people who haven’t attended the beginners course but who understand the Exposure Triangle (how shutter speed, aperture and ISO work together) and are comfortable using the Aperture or Shutter Control modes on their camera. An opportunity to have some of your images critiqued. Shooting in RAW rather than JPEG. How to shoot in Manual exposure mode. How to handle trickier lighting conditions, including backlighting, high contrast scenes, low light and nighttime photography. How to take your composition to the next level. Do you need any new lenses and if so which ones. 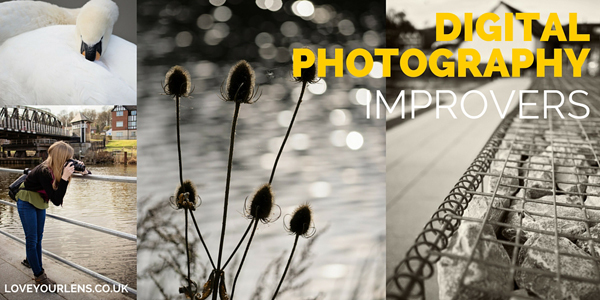 Some photography projects to inspire you and develop your photography. How to perform simple edits in Photoshop Elements (enhancing colours, converting to black and white). Practical assignment around the historical areas of Northwich near the river Weaver. GIFT VOUCHERS are available. Contact me to order your gift voucher for any workshop or for one to one tuition.